Department of Pension & Pensioners' Welfare, 3rd Floor, Lok Nayak Bhavan, Khan Market, New Delhi-110003.Dated the 2nd Aug, 2017. **OFFICE MEMORANDUM **Subject: Special benefits in cases of death and disability in service - regulation and payment of Disability Pension/Family pension under Central Civil Service (Extraordinary Pension) Rules in implementation of recommendations of the 7th Central Pay Commission - regarding. Dated the 2nd Aug, 2017. 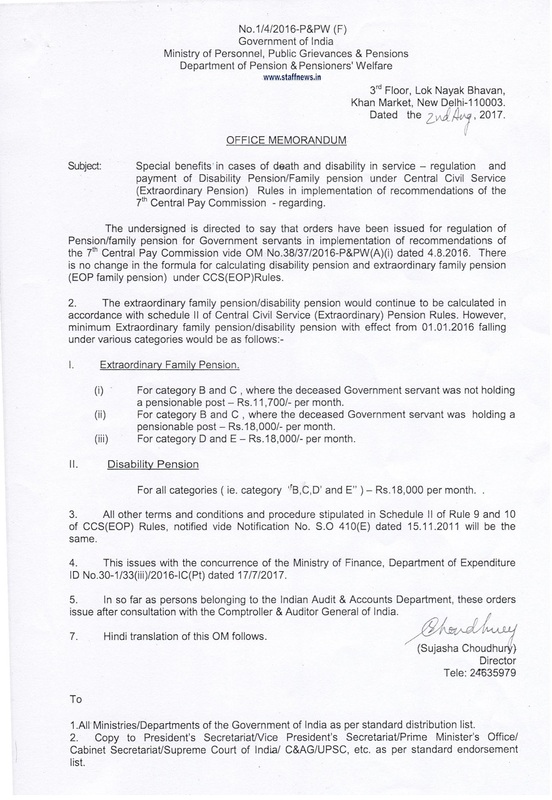 Subject: Special benefits in cases of death and disability in service - regulation and payment of Disability Pension/Family pension under Central Civil Service (Extraordinary Pension) Rules in implementation of recommendations of the 7th Central Pay Commission - regarding. (i) For category B and C , where the deceased Government servant was not holding a pensionable post - Rs.11,700/- per month. (ii) For category B and C , where the deceased Government servant was holding a pensionable post - Rs.18,000/- per month. (iii) For category D and E - Rs.18,000/- per month. For all categories ( ie. category "B,C,D and E" )- Rs.18,000 per month. 3. All other terms and conditions and procedure stipulated in Schedule II of Rule 9 and 10 of CCS(EOP) Rules, notified vide Notification No. 8.0 410(E) dated 15.11.2011 will be the same. 4. This issues with the concurrence of the Ministry of Finance, Department of Expenditure ID No.30-1/33(iii)/2016-lC(Pt) dated 17/7/2017. 7. Hindi translation of this OM follows.